The Alpha Performance Boost Cooler System is a great addition to your forced induction vehicle whether it is stock or modified. The cooling system features a large, high efficiency heat exchanger located at the front of the car, a reservoir that holds over a gallon of coolant in the passenger front fender well and a high flow brushless pump which runs complementary to the factory pump. 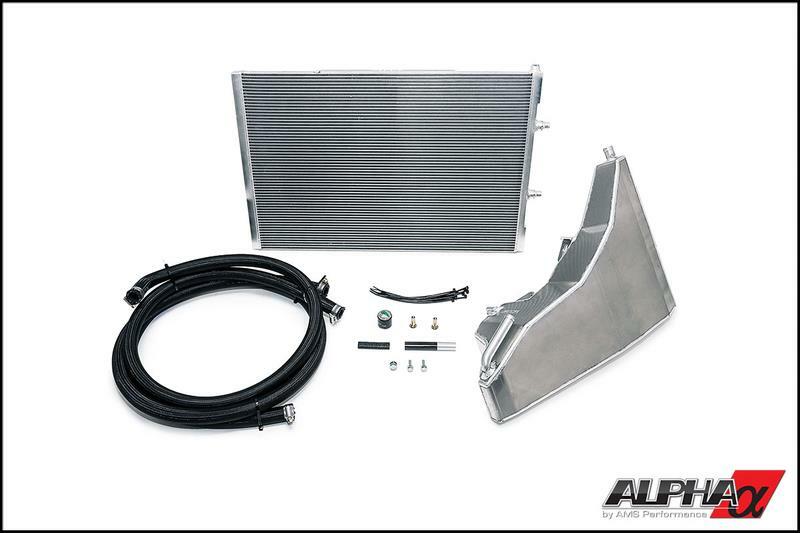 Whether you live in a hot climate area, enjoy long spirited drives in the mountains or long high speed pulls on airstrips, the Alpha Performance Boost Cooler will keep your intake temps low and maintain your vehicle’s maximum output no matter the ambient conditions. As with all Alpha Products, everything needed to install the system is included – bolts, fittings, lines etc. Best of all, no drilling on the car is required. The most important part of an efficient heat exchanger system is the core, skimping here could mean the overall performance of an ‘upgraded’ system might be worse than stock! Our Alpha core is a high quality, made in the UK, double pass design where the coolant makes two passes through the unit vs competing products which use a single pass design. Our unit works with the factory heat exchanger giving you a significant boost in cooling power. Innovative Reservoir Means Zero Lost Trunk Space! The hand fabricated Alpha reservoir acts as a large heat sink to keep coolant temperatures low and stable. With over a gallon of additional coolant on board, it increases the cycle time allowing it to dissipate more heat before being recirculated, working as a large thermal reservoir, keeping the horsepower-killing heat soak at bay. With its trick mounting location in the passenger fender well, you don’t have to worry about running lines to the rear of the car, drilling holes in your trunk’s floorboard, or giving up valuable trunk space! To give you the best possible performance and keep the coolant flowing efficiently through the heat exchangers, we added an additional high flow, brushless pump to run in conjunction with the OEM pump. The combination of the two pumps allow a high flow rate to keep the fluid moving and maintains that flow rate at higher pressures giving you the assurance your car will stay cool in hot climates or on those top speed pulls.